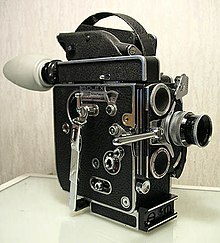 Machina photographica 16 mm spring-wound Bolex "H16" Reflex est camera popularis prima, in scholis pellicularum aliquando adhibita. In hac imagine, ex pellicula Man with the Movie Camera, Michael Kaufman partes hominis machinae photographicae agit qui vitam in opericulum adducit, optimum conspectum petentem. Photogramma ex La Sortie des usines Lumière à Lyon, prima pellicula documentaria a nonnullis habita. Pellicula documentaria, vel pellicula documentalis, est pellicula ad conservandos certos realitatis aspectus designata, imprimis eo consilio, ut discipulos erudiat aut documenta historica conservet. Tales pelliculae primum in film stock capi solebant (in solo medio olim in usu), sed ratio pellicularum faciendarum nunc video et productiones digitales comprehendit, quae direct-to-video (fortasse 'recte-ad-video'), in spectaculum televisificum factum, vel pro exhibitione in cinemateis emissae possunt. Vocabulum documentarium describi potest "tractatio pellicularum factarum, traditio cinematica, et modus receptionis spectatorum" qui se constanter evolvit, finibus claris carens. Documentary, vocabulum Anglicum ('documentarium' significans), primum pelliculis huius generis adhibitum est in recognitione pelliculae Moanae Roberti J. Flaherty, a "The Moviegoer" scripta, nomine calami Ioannis Grierson, in diario New York Sun die 8 Februarii 1926 edito. ↑ Bill Nichols, "Foreword," in Documenting The Documentary: Close Readings of Documentary Film and Video, ed. Barry Keith Grant et Jeannette Sloniowski (Detroiti: Wayne State University Press, 1997). ↑ Jonathan Rosenbaum, Review of Moana..
↑ Ann Curthoys et Marilyn Lake, Connected Worlds: History in Transnational Perspective. (Australian National University Press, 2004), p. 151. Aitken, Ian, ed. 2005. Encyclopedia of the Documentary Film. Novi Eboraci: Routledge. ISBN 9781579584450. Barnouw, Erik. 1993. Documentary: A History of the Non-Fiction Film. Ed. 2a. Novi Eboraci: Oxford University Press. ISBN 9780195078985. Burnett, Ron. "Reflections on the Documentary Cinema." Burton, Julianne, ed. 1990. The Social Documentary in Latin America. Pittsburgi Pennsylvaniae: University of Pittsburgh Press. ISBN 9780822936213. Ellis, Jack C., et Betsy A. McLane. 2005. "A New History of Documentary Film." Novi Eboraci: Continuum International. ISBN 9780826417503, ISBN 9780826417510. Goldsmith, David A. 2003. The Documentary Makers: Interviews with 15 of the Best in the Business. Hove Sessexiae Orientalis: RotoVision. ISBN 9782880467302. Klotman, Phyllis R. and Culter, Janet K., eds. 1999. Struggles for Representation: African American Documentary Film and Video. Bloomington et Indianapoli: Indiana University Press. ISBN 9780253213471. Leach, Jim, et Jeannette Sloniowski, eds. 2003. Candid Eyes: Essays on Canadian Documentaries. Torontoi et Buffali: University of Toronto Press. ISBN 9780802047328, ISBN 9780802082992. Nichols, Bill. 2001. Introduction to Documentary. Bloomington: Indiana University Press. ISBN 9780253339546, ISBN 9780253214690. Nichols, Bill. 1991. Representing Reality: Issues and Concepts in Documentary. Bloomington: Indiana University Press. ISBN 9780253340603, ISBN 9780253206817. Nornes, Markus. 2007. Forest of Pressure: Ogawa Shinsuke and Postwar Japanese Documentary. Minneapoli: University of Minnesota Press. ISBN 9780816649075, ISBN 9780816649082. Nornes, Markus. 2003. Japanese Documentary Film: The Meiji Era through Hiroshima. Minneapoli: University of Minnesota Press. ISBN 9780816640454, ISBN 9780816640461. Rotha, Paul. Documentary diary; An Informal History of the British Documentary Film, 1928–1939. New York: Hill and Wang, 1973. ISBN 9780809039333. Saunders, Dave. Direct Cinema: Observational Documentary and the Politics of the Sixties. London: Wallflower Press, 2007. ISBN 9781905674169, ISBN 9781905674152. Saunders, Dave. Documentary: The Routledge Film Guidebook. Londinii: Routledge, 2010. Tobias, Michael. The Search for Reality – the Art of Documentary Filmmaking. Studio City, CA: Michael Wiese Productions 1997. ISBN 0941188620. Walker, Janet, and Diane Waldeman, eds. 1999. Feminism and Documentary. Minneapoli: University of Minnesota Press. ISBN 9780816630066, ISBN 9780816630073. Wyver, John. The Moving Image: An International History of Film, Television & Radio. Oxford: Basil Blackwell Ltd. in association with the British Film Institute, 1989. ISBN 9780631155294. Zimmermann, Peter (Hrsg. ): Geschichte des dokumentarischen Films in Deutschland. Herausgegeben im Auftrag des Hauses des Dokumentarfilms Stuttgart. 3 Bände. Reclam. Stuttgart 2005. Brigard Emilie de. 1995. 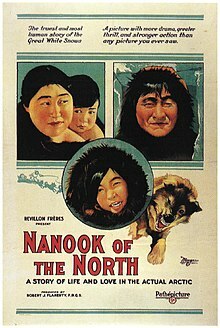 The History of Ethnographic Film. In Principles of Visual Anthropology, ed. Paul Hockings, 13–43. Berolini et Novi Eboraci: Mouton de Gruyter. Devereaux, Leslie. 1995. Cultures, Disciplines, Cinemas. In Fields of Vision. Essays in Film Studies, Visual Anthropology and Photography, ed. Leslie Devereaux et Roger Hillman, 329–339. Berkeleiae: University of California Press. Ginsburg, Faye, Lila Abu-Lughod, et Brian Larkin, eds. 2002. Media Worlds: Anthropology on New Terrain. Berkeleiae Californiae: University of California Press. ISBN 9780520232310. Grimshaw, Anna. 2001. The Ethnographer's Eye: Ways of Seeing in Modern Anthropology. Cantabrigiae: Cambridge University Press. ISBN 9780521773102. Heider, Karl G. 1994. Ethnographic Film. Austin: University of Texas Press. de Heusch, Luc. 1962. Cinéma et Sciences Sociales. Lutetiae: UNESCO. Editio Anglica: The Cinema and Social Science: A Survey of Ethnographic and Sociological Films. Jameson, Fredric. 1990. Signatures of the Visible. Novi Eboraci et Londinii: Routledge. Jordan, Pierre-L. 1992. Premier Contact-Premier Regard, Marseille: Musées de Marseille. 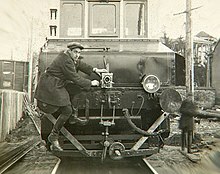 Images en Manoeuvres Editions. Leroi-Gourhan, André. 1948. Cinéma et Sciences Humaines: Le Film Ethnologique Existe-t-il? Revue de Géographie Humaine et d'Ethnologie 3:42–50. MacDougall, David. 1992. Whose Story Is It? In Ethnographic Film Aesthetics and Narrative Traditions, ed. Peter I. Crawford et Jan K. Simonsen, 25–42. Aarhus: Intervention Press. MacDougall, David. 1998. Transcultural Cinema. Princetoniae: Princeton University Press. ISBN 9780691012346. Rony, Fatimah Robing. 1996. The Third Eye: Race, Cinema and Ethnographic Spectacle. Durham Carolinae Septentrionalis: Duke University Press. ISBN 9780822318408. Sadoul, Georges. 1977. Histoire Générale du Cinéma. Vol. 1, L'Invention du Cinéma 1832–1897. Lutetiae: Denöel. Sorlin, Pierre. 1977. Sociologie du Cinéma. Lutetiae: Aubier Montaigne. Xavier, Ismail. 1993. Cinema: Revelação e Engano. In O Olhar, ed. Adauto Novaes, 367–384. São Paulo: Companhia das Letras. Vicimedia Communia plura habent quae ad pelliculam documentariam spectant (Documentary film, Documentary films). Novissima mutatio die 2 Iunii 2018 hora 12:29 facta.